Effective April 27, 2017, Book Enthusiast Promotions and DRC Promotions will cease to exist...They re-emerge as Buoni Amici Press, LLC, a Full Service Literary PR Firm. After a few years of hobnobbing with each other online and working together on a few joint projects Debra Presley, Book Enthusiast Promotions and Drue Hoffman, DRC Promotions became friends and began discussing ways they could help authors become successful. With a mutual desire to celebrate the great authors and books they come across they decided to pool their vast knowledge and resources together and Buoni Amici Press, LLC was born. Combined, they bring authors nearly 10 years experience in book marketing, promotions and design and a desire to bring authors stellar services and sleek design. As a tour host you will receive weekly emails about all our upcoming events that you can choose to sign up for. We always provide an easy copy & paste HTML will be provided. 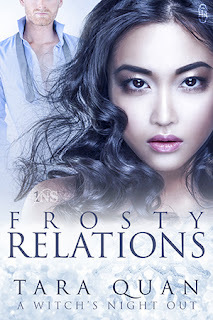 Are you already signed up with Book Enthusiast Promotions or DRC? 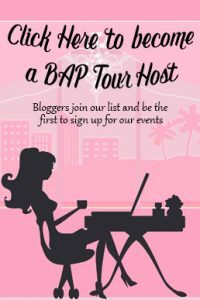 No worries, you are already on the Buoni Amici Press Tour Host list. Subscribers are able to unsubscribe, worry free at any time. Tired of filling out sign up forms? We hear you. 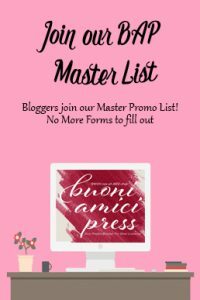 Join our Promo Only Master List and forget the forms. UNLESS you are interested in reviewing a particular book, then you will need to sign up through the regular form. Want to get ARC's before anyone else? Join the BAP Advance Team and get access to new releases from our authors before anyone else. Please review the requirements for being a part of this elite team carefully.